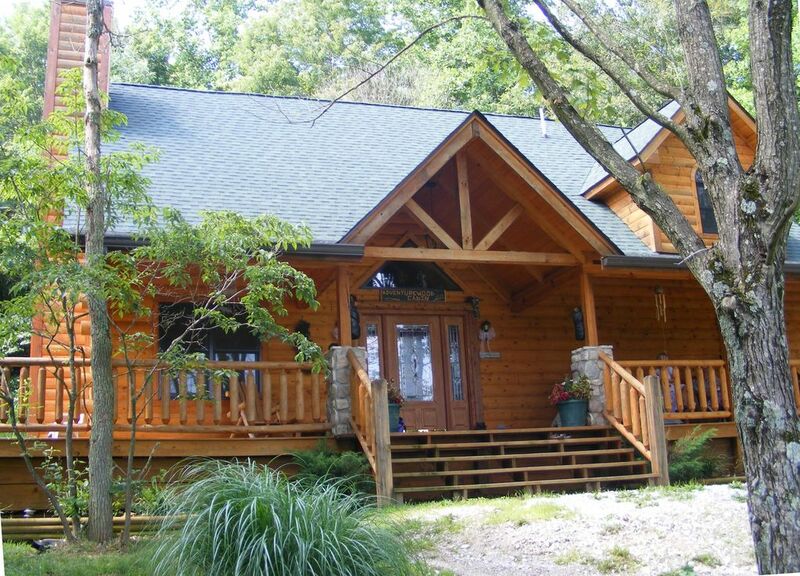 ADVENTUREWOOD is a Luxury 3 bedroom, 2 bath, Log Cabin in beautiful Brown County, Indiana. It features a six person hot tub on a screened in porch, a jacuzzi in the master bath, two indoor fireplaces - one wood, one gas, an outdoor firepit, and a pool table. Set on 7 private acres in the trees, Adventurewood is private & secluded. Adventurewood was built for those who enjoy the rustic atmosphere of nature with all the amenities in an upscale lodge. The gorgeous two story stone fireplace is the focal point when you enter this beautiful cabin and the scent of pine envelopes you as you take in the lodge/pine decor. The kitchen is fully equipped for your every cooking need. The dining room table can seat eight for family gatherings. The Master Suite is a 'Honeymooner's Dream' with King Bed, lodge/pine tree decor, and private balcony. Enjoy the luxurious Master Suite Bath with 2 person heart-shaped Jacuzzi while watching the flames in the see-thru fireplace. Relax in the 6 person Hot Tub on the screened porch surrounded by woods and romantic accent lighting, enjoy a bottle of wine by the outdoor fire pit under the trees or on the log swing. Enjoy a game of Pool in the loft watching the fire below, or relax in the rocking chairs on one of the many porches and enjoy watching the deer & wildlife passing by. For relaxation, peace and tranquility in a beautiful wooded setting surrounded by nature, birds and deer, come to Adventurewood to reunite and renew with family and friends or that special romantic getaway with your loved one. You won't want to leave this luxury home in the woods. This is beautiful Brown County Indiana luxury living at it's best. For more information please visit adventurewoodlogcabin.com. Q: How far is the cabin from downtown Nashville, IN? A: The cabin is located about 8 miles from Nashville, mid-way between Nashville and Bloomington just off Rt. 46. Easy access to both Bloomington and Nashville. A: There are 3 beds, one in each of the 3 bedrooms, and there is a sleeper sofa in the loft near the pool table, but we don't call the loft a "bedroom". See additional details below. A: Please review your quote carefully before booking to avoid surprises. The "average" rate displayed is for 2 guests. There is an additional per-night charge for additional guests that will appear on your quote as "Additional Guest Fee". State and county taxes add up to 12 percent. Q: How far away is Brown County State Park? A: The nearest entrance, the West Gate, is about six miles away. Q: How does check-in work? A: If we are not otherwise occupied, one or both of us will meet you at the cabin for a quick walk-through. Otherwise, we will provide a key code by phone. You will receive an email with details and driving instructions about two weeks prior to your check-in date. We enjoy living in beautiful Brown County Indiana for scenery, wildlife, outdoor activities such as fishing, hiking, mushrooming, and sailing, cultural events at nearby IU and Bean Blossom, the wonderful artists and craftsmen in the area who open their studios each year for the artists' tour and sell their art in Nashville shops, and the incredible variety of great restaurants. Adventurewood was built in 2005 on 7 acres by Connie and James Dickman. The property was designed from the start to be a luxury vacation rental cabin and includes many thoughtful features that cannot be found in other rental properties. The popularity of Adventurewood proves that they found a winning combination! Adventurewood is the perfect place for a romantic getaway, family vacation, or gathering of friends. The incredible master suite includes a jacuzzi and see-though fireplace that can be viewed from the bedroom or the bath. The wood fireplace in the great room is perfect for lounging with friends or curling up with your sweetheart. The hot tub will sooth your body. You can also enjoy an outdoor fire and gather around the fire pit, or watch the deer, wild turkeys, and hawks from the front porch. Shared Main bath downstairs w/ adjoining door to guest Bdrm 1 - Tub/Shower combo Upstairs Master Ensuite bath with see-through fireplace and huge 2 person heart shaped Jacuzzi. The beautiful rolling and wooded hills and valleys are your view from the front porch. Back view is woods. Outdoor firepit for year round use. Firewood is supplied. Bath towels, hand towels, wash cloths, and spa (hot tub) towels are provided. There is a pull-out drying rack in the hot tub porch for drying towels between uses. Full-sized drip coffee maker. Plenty of filters on hand. Kitchen is equipped with service for 8 plus bread maker, crock pot, coffeepot, toaster, blender, hand mixer, etc. The dining area seats 8 guests. Dish TV with hi-def channels - America's favorite 120 programming, DVR, in Great Room with wall mounted flat panel TV. Smaller wall mounted TV with same channels in the master suite. A selection of games is available in the loft. Pool table and accessories in the loft. Toy chest with children's toys under the main stairs. Adventurewood sits on a hill on seven private acres. Lawn and small garden areas surround the cabin. The fire pit patio is adjacent to the cabin. There is a log swing downhill from the firepit. Adventurewood has wide decks on three side. The screened in back porch has a picnic table and hot tub. 6 person Hot Tub on private screened porch surrounded by woods. Adventurewood Log Cabin can accommodate a wide variety of vacation and retreat groups. The many different gathering spaces encourage comfortable socializing with friends or family. Many come and "nest" in the cabin for their entire stay, while others visit the many craft shops in Nashville or events at Indiana University. Adventurewood is convenient for both. Unlike some isolated cabins in the area, Adventurewood is easy to get to and has great cell phone reception. You can stay connected on your getaway with WiFi. Although most people don't come to Adventurewood just to watch TV, we do have the latest Dish TV satellite dish and new flat panel TVs for viewing the high-def channels. You can prepare meals in our fully-equipped kitchen, or travel to one of the many fine restaurants in Nashville or Bloomington. Everything from fast food to haute cuisine is nearby. Adventurwood is close to Lake Monroe boating and has room for parking your boat. The closest launch ramp is Crooked Creek. Lovely and very well equipped log home. Very peaceful and convenient location for our girls' weekend. Loved the hot tub and outdoor seating area. The master bathroom is awesome!! The only recommendation may be to update the living room couches. They're a bit shabby especially compared to the rest of the décor. Wonderful home. Thanks for sharing. The only issue we had was the slanty floor in the loft. It made playing pool not very enjoyable. We loved every minute we were at Adventurewood-every need had been anticipated ---the house is just beautiful beyond compare--once settled it just felt like home. We are looking forward to returning in September!!! Lovely Cabin with all the amenities needed for a relaxing stay! This is a lovely cabin that has everything you need for a wonderful and relaxing stay. The cabin is well appointed with everything you need. We loved the large master bath with the whirlpool tub and fireplace. The hot tub and fire pit were also perfect to relax. Jeff and Amy were great hosts and made sure we had a great stay! Perfect secluded cabin in the woods! Perfect for a great weekend away! The cabin was clean and had everything we needed. Short drive to Nashville or Bloomington. We have already booked our next visit! Beautiful cabin. Cozy and clean. We had a great time. Just needed a couple of days to relax. Enjoyed shopping in Nashville and an evening in Bloomington. Hot tub was great and the cabin had everything we needed including firewood. The owners were super easy to work with. Definitely looking to stay here again.